It’s been quite a while since I’ve put up a new post. Even longer since things felt relatively “normal” for me. The truth is, the last 6 months have been extremely transient and challenging for me personally on multiple levels. If you follow me on Instagram, you know that I’ve addressed this briefly, simply stating that I’ve always wanted to come from a place of transparency and integrity when it comes to my blog & social channels. I have always loved blogging because aside from the technical part, I don’t really have to put in any extra effort. I share food I love and am actually eating in real time, I talked about things I’ve learned in the moment… being someone who I’m not or somehow pretending like everything is okay when it isn’t, is not something that appeals to me. Mostly because (and I feel this even more so after the last 6 months of my life), I think there is so much more to learn and share where you’re coming from a place of truth. Whether or not someone wants to go into the minute details (which often aren’t important), doesn’t mean that experiencing the sad and scary parts of life can’t teach all of us some incredible lessons that I then we can impart to others. While I’m not ready to say much at this point, what I can say is that what’s been happening for me has absolutely called into focus all aspects of my life and forced me to really question what it is I want in life and for my future. Really take a hard look at what’s serving me and what isn’t. For now, this blog and my career working with natural products brands is still extremely meaningful. Having said that, what I do know is that maybe not right away, but soon, my approach to this blog and my focus will likely shift a bit. What does that mean? Well, you’re probably going to be hearing from me a lot more about lifestyle and mindset than about food. Not that food won’t still be an important part of what I do, but in regard to my own journey (health & otherwise), mindset has emerged as one of, if not THE most important theme for me when it comes to health & wellness. For now though, I am just taking it easy, laying low and trying to heal my body and mind. First on the agenda? This month’s Whole30! 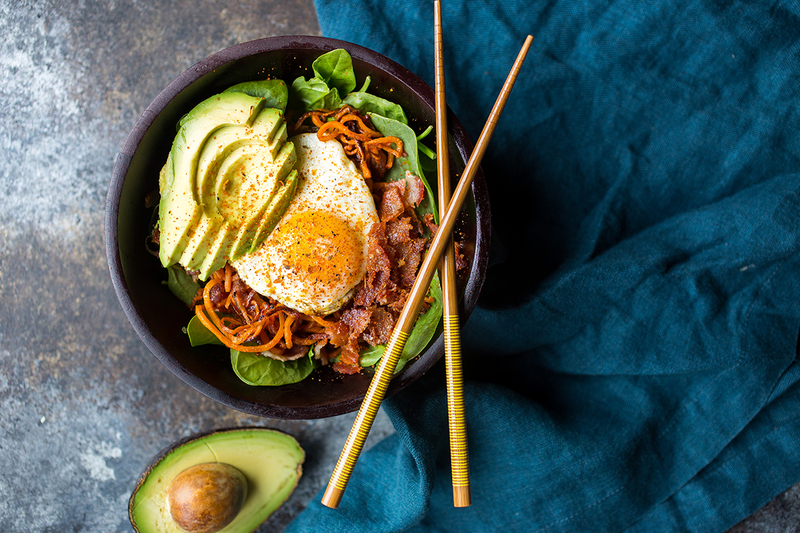 Since I’ve been feeling a little more settled lately, I figured this was perfect time to put up a new post and bring you all a new delicious recipe… that also happens to be Whole30 compliant! 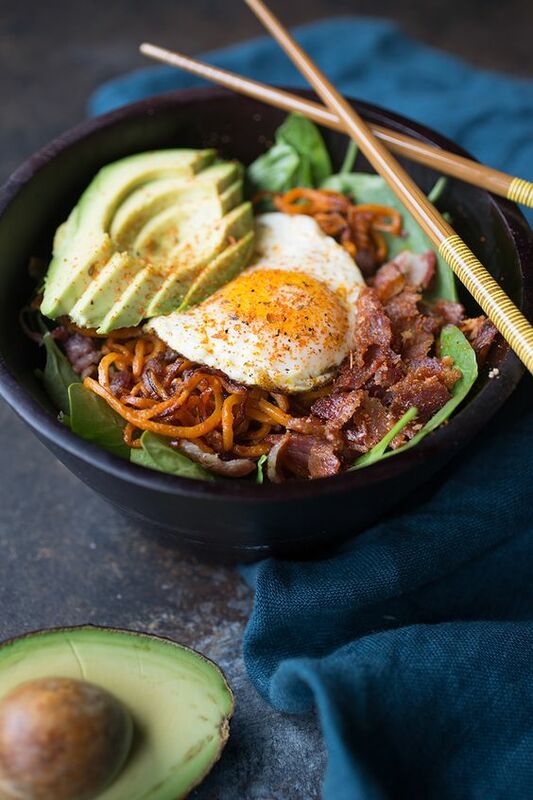 This Spiralized Sweet Potato Breakfast Bowl can be made just the way you like it. Feel free to swap out veggies, meat of choice, spices, etc. This is one of the most versatile breakfasts there are. I like to spiralize the sweet potatoes ahead of time, which ends up saving me a lot of time in the morning. I will often spiralize 3-4 sweet potatoes at a time and then just prepare the rest of the ingredients fresh each morning. It is also perfectly fine to cook your spinach with the sweet potato if you don’t want to eat it raw! Heat a cast iron skillet on medium high heat and add two strips of bacon. Cook until crispy and then remove from pan and set aside. Add the spiralized sweet potatoes to the same pan, using the leftover bacon fat as your cooking fat. On medium heat, move the sweet potatoes around frequently or allow to sit for a minute or two at a time to get them a little crispy. If cooking spinach, this is when you would add it. Add half of the seasoning and save the rest for your egg. When sweet potatoes are cooked to the extent that you want them to be, remove from the pan and add to a bowl with raw spinach on the bottom. In the same pan, add a tablespoon of avocado oil and allow to heat briefly. Crack one egg in the pan and cook a couple minutes each side until crispy on the outside but still soft on the inside. While the egg is cooking, crumble the bacon on top of the sweet potato and spinach. When egg is done, add on top of sweet potatoes, followed up avocado and the rest of the Meat & Potatoes seasoning. Any way I can eat noodles for breakfast is the way to go! These bowls look seriously delish- and so nutritious too!